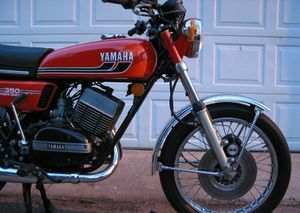 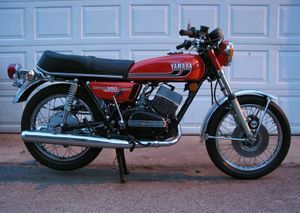 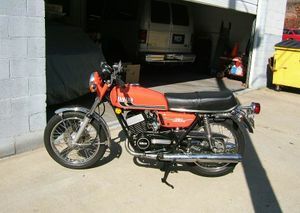 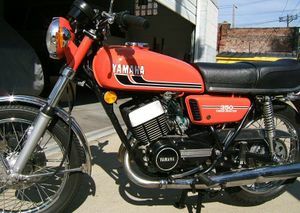 The Yamaha RD350 was a 350cc twin cylinder two-stroke street motorcycle manufactured by Yamaha from 1973 through 1975. 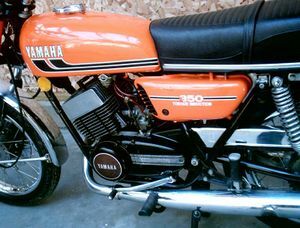 The RD350 was well developed for the time, aircooled, two cylinder, Autolube equipped (automatic oil injection), 6 speed (in some markets, such as the UK, the first model was sold in 5-speed form) two-stroke, street motorcycle produced by Yamaha. 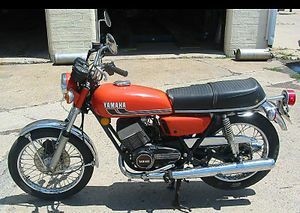 It was the premier sport lightweight of the early 70's. 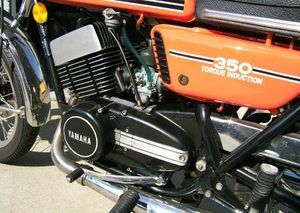 It was evolved from the front drum-braked, 5 speed Yamaha 350cc "R5". 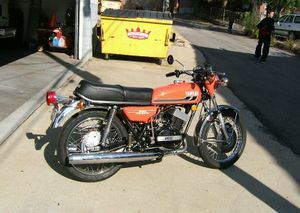 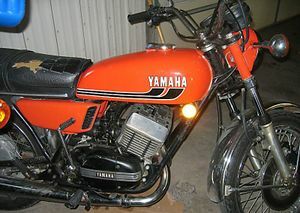 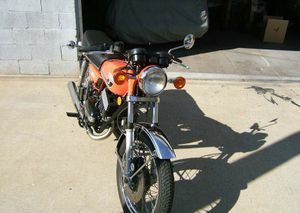 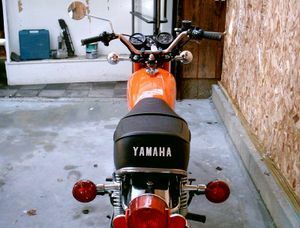 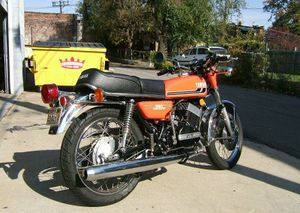 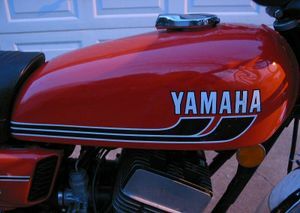 It was in production as a purple with white side details RD350 (1973), the RD350A, simple purple tank with "Yamaha" on the tank and the orange with white, 1975 (RD350B). 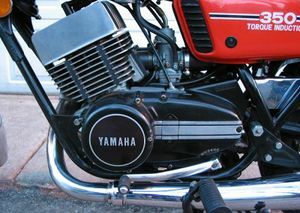 All models were equipped with "Autolube" automatic oil injection, relieving the user from the need to be mixing gasoline and two-stroke oil. 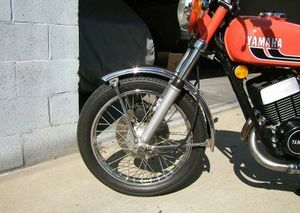 Rim sizes were 18" WM2 (1.85") front and 18" WM3 (2.15"), both being of chromed, wire spoked steel construction. 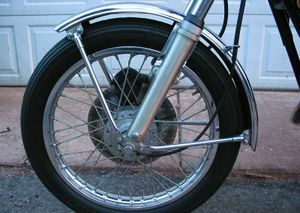 In the UK, rim sizes were 1.60 front and 1.85 rear. 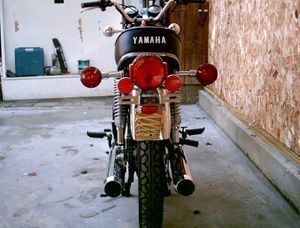 Brakes were: single front disc brake and a rear drum brake. 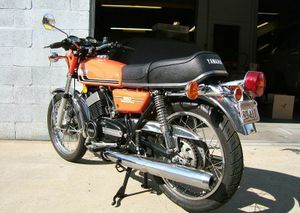 Cycle magazine described the combination as the best in its class. 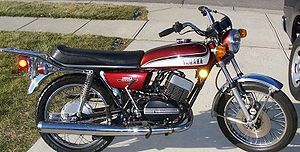 The frame dimensions of the street 350 were very similar to the famous Yamaha TZ250 and TZ350 series factory road race bikes, differing mainly in weight and front fork rake - the RD being ~27 degrees and the TZ being ~25 degrees. 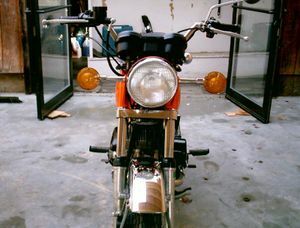 The frames appeared similar, side by side, with the street frame adorned with many brackets for the street equipment. 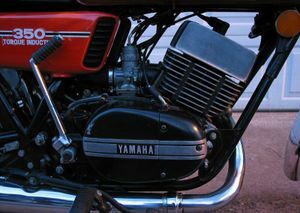 The weight difference was substantial though, with the street going RD frame weighing almost twice as much as the "TZ" roadrace race frame. 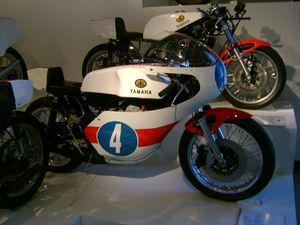 Many enthusiasts would convert their RD350 to specifications similar to a TZ350, such machines would then be reasonably competitive in club racing events. 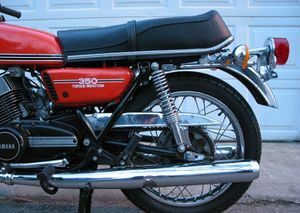 The bike made about 32 to 35 rear-wheel HP - very fast then, but as of 2006, some 600cc bikes now make about 100 HP. 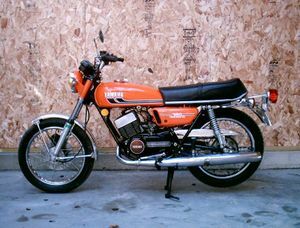 A contemporary of the RD was the Kawasaki H2 750cc Triple, said to make 72 to 75 true HP (tested by Cycle Magazine at 55bhp). 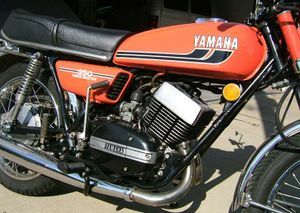 The 350 evolved into the so-called "cleaner running" RD400C in 1976, the "D" and "E" in 77-78 and the final model, the white 1979 RD400F. 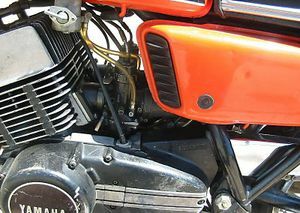 There was a myth that RD stood for "Racing Death" and "Road Death" and that it was the Japanese revenge for the atomic bombings of Hiroshima and Nagasaki, as it claimed the lives of many US riders, but this is pure fiction (according to Japanese representatives).It was thought by some RD stood for "race developed." 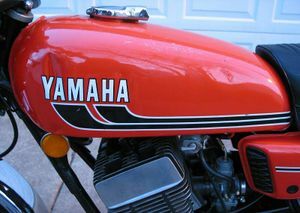 But a long time Yamaha mechanic recently dispelled this myth on the uk Yamaha RD forum, this is his explanation and he has worked with and raced them since the seventies. 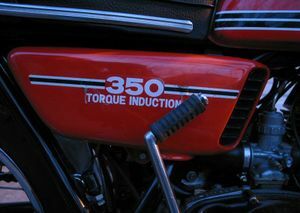 "We always understood it to be a series of letters that explain the bikes make up and function two stroke twin etc"
The PR guys jumped on the race developed band wagon. 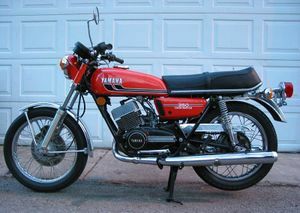 The bike was a very snappy performer and many new riders purchased the bike. 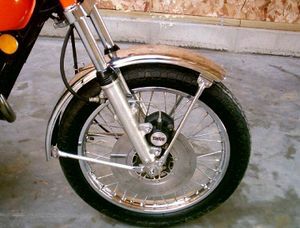 The combination of a stiff suspension, abrupt power delivery, very powerful brakes and inexperienced riders was not a good one. 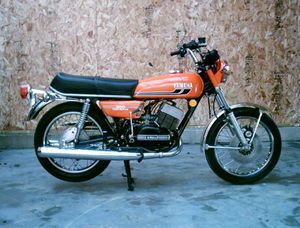 It was regarded as being "too fast" for most new riders. 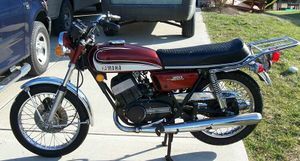 Its good performance, light weight, and easy maintenance made it a world favorite but it ultimately suffered at the hands of increasingly stringent noise and tighter emissions standards in the US market and changing consumer appeal. 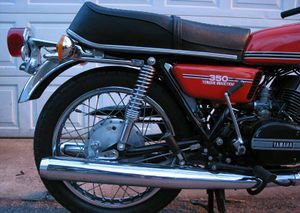 The US was the first country to impose extremely tight emission standards for new vehicles. 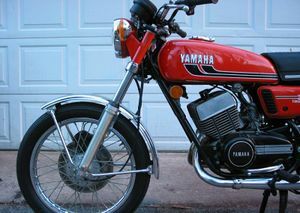 Uncontrollable 1st gear wheelies in the hands of careless riders were the biggest problem.